0.1 nT resolution in 100,000 Nanotesla field. 0.01% basic accuracy traceable to NIST. Analog output for recording or other purposes. One button ambient field cancellation and measurement. RS232 and 10 base-T Ethernet connectivity for remote programming and data acquisition. Math functions (NULL, Min/Max/Average, peak-to-peak). Data storage (8000 samples) and plotting capability. Settable upper and lower alarm limits. 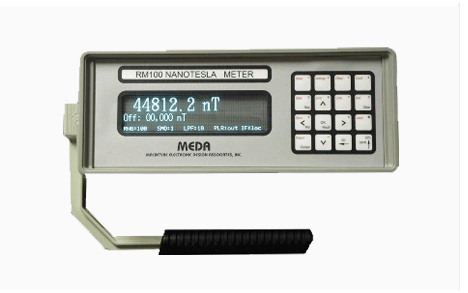 The accuracy and traceability of the RM100 makes it highly suitable for calibrating systems that are used to calibrate other magnetometers and magnetic sensors. The RM100 uses a differential measurement technique employing two subsystems to achieve its high accuracy. The first subsystem is a user controlled field neutralization unit with a dynamic range of ±100,000 nT and a resolution of 0.1 nT. The second is a low noise analog output magnetometer that measures the difference between the ambient and neutralization fields. The neutralizing field and difference field are displayed on a large Vacuum Florescent Display on the front panel. The difference field is also provided as an analog voltage through a connector on the back of the chassis. The factory calibration of the neutralization subsystem to ±0.01% is traceable to NIST. The functions of the RM100 can be remotely programmed and data transferred through either the RS232 serial port or the 10 base-T Ethernet connection using SCPI command syntax. Baud rates range from 9,600 to 115,200. The Ethernet connection allows the RM100 to be controlled over a LAN or the Internet. Download the User's Manual for a complete description of the RM100.